Pockets are practically essential, and they are easy to sew. The article “How to Add Pockets” in the Spring 2017 SewStylish digital issue offers step-by-step instructions for adding in-seam pockets to skirts. 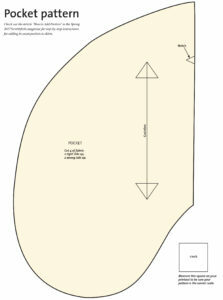 Here’s a PDF pattern piece you can use to cut pockets for your next sewing project. Print the pattern piece on letter-sized paper with a portrait orientation. Measure the 1-inch registration square on your printout to make sure the pattern piece printed at the correct scale.